In August, 2009, Betsy and I traveled to Florida to see her brother in Jacksonville and to celebrate Betsy’s birthday. After leaving Jacksonville we stopped in St. Augustine to visit Castillo San Marcos, the fortress built by the Spanish to protect their outpost. To see larger versions of these pictures and others, click HERE. This entry was posted on October 10, 2012 at 3:37 am and is filed under Travels. You can follow any responses to this entry through the RSS 2.0 feed. You can leave a response, or trackback from your own site. This looks neat and that guard is quite colorful! Florida in August…and Betsy doesn’t like heat. Nevertheless, it looks as if you had a good time and got some wonderful pictures. I love the old fort!! Thanks for the memories of my visit there years ago!! Hope your week is going well, George!! It’s so interesting, because history. 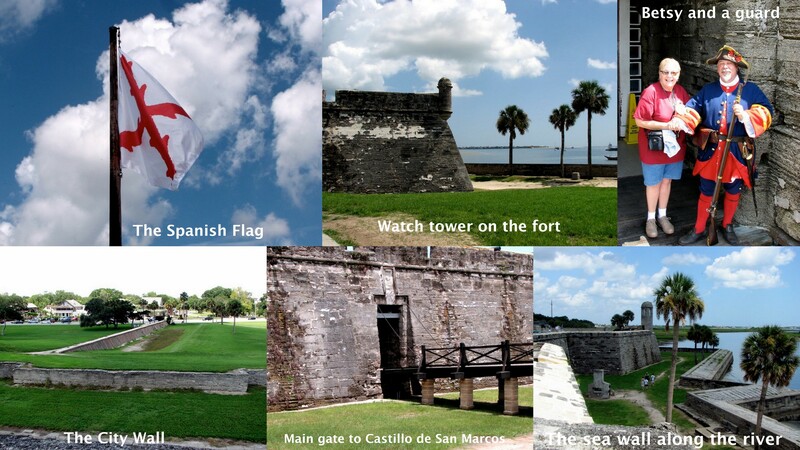 St. Augustine is such a great place to explore! That looked like a fun holiday and treasured memories. Thanks for giving us a pictorial tour of the fort. We stopped in St. Augustine many years ago on our first trip to Florida. We haven’t been back; but I do remember that I loved the area. That’s wonderful “postcard” having so many gorgeous photos. Thank You. Glorious sky! Happy sky watching.